The next two weeks are going to be unofficial Fantasy Worldbuilding Fortnight for me. To this end, I’ll be sharing updated posts from my 2010 Jigsaw-Novel project. The Jigsaw Novel is a series of world-building exercises, prompts and ideas to dig deep into the world you are creating for your fiction, and build up a picture of that world, piece by piece. You’ll find a hundred or so daily writing prompts in the tags, plus the themed Jigsaw-Novel elements such as Weather, Industry, Education. I created these pages to help generate creative writing. The different topics are designed to generate writing about many different aspects of a fictional world – maybe a world you can use for the next Nanowrimo. For me, world building is not, primarily, about drawing maps or creating weird names for places – it’s about the society in that world. How do people live? Where do they work? What do they believe? Imagining daily life generates more story ideas – for me – than constructing the rules of a society from the outside looking in. I find when watching fantasy or science fiction on TV, that I’m fascinated by the background characters – people in the streets, carrying out their work, going shopping or to school or worship. What are their stories? How are they affected by the big story happening closer to the camera? This is what inspired me to create the jigsaw-Novel way of working. It could be used to fill in gaps in early world building, or as a way to plot a society from the ground up – focusing on ordinary life. In a fantasy world, religion and magic are key elements of society and would affect every aspect of life. The Jigsaw-Novel is designed to help spot logic inconsistencies, like the question I saw recently about Fantastic Beasts: why, when Newt and Tina can simply apparate to new locations, did Newt take a steamship to America? It’s also meant to be a fun way of creating new story ideas by creating situations and characters. This is about writing, not pre-writing or background-making. Each activity should leave you with a small piece of your fictional world, or the start of a story set there. Pick a Category on the right, such as Household, Crime or Career to see the activities and get started. Or choose the category called Daily Writing Prompt. 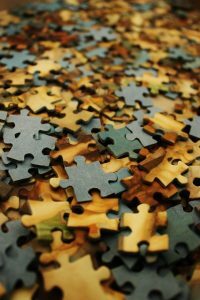 I’m busy updating the Jigsaw-Novel template to record the pieces of your world. Try a prompt, or category, and let me know what you think. I’m always looking for suggestions and improvements! Thanks! This post was originally published in December 2011.